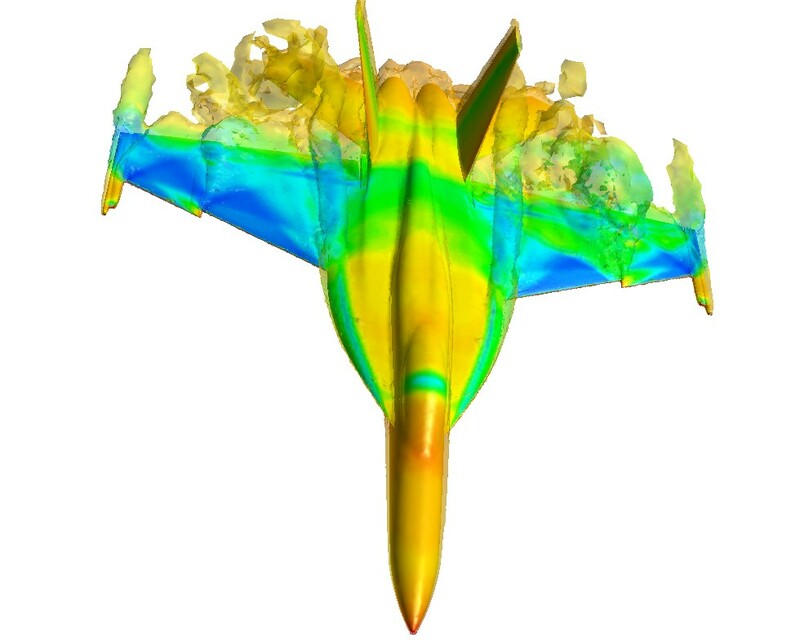 Unsteady measurements on a model of a pre-production F/A-18E were made in order to investigate the potential unsteady causes and/or indicators of AWS. The initial findings from these tests showed highly unsteady surface pressures indicative of shock oscillation. Although Reynolds-averaged Navier Stokes (RANS) CFD calculations were fairly successful in predicting mean flow characteristics indicative of AWS, they failed to predict unsteady shock oscillations even when run time accurate. The turbulence models employed in RANS methods necessarily model the entire spectrum of turbulent motions. While often adequate in steady flows with no regions of reversed flow, or possibly exhibiting shallow separations, it appears inevitable that RANS turbulence models are unable to accurately predict phenomena dominating flows characterized by massive separations. Eddy Simulation (LES). The primary advantage of DES is that it can be applied at high Reynolds numbers as can Reynolds-averaged techniques, but also resolves geometry-dependent, unsteady three-dimensional turbulent motions as in LES. Figure 2: Grid prior to adaption (bottom), and afterwards (top). Cobalt was applied to the pre-production F/A-18E using both DES and RANS models. 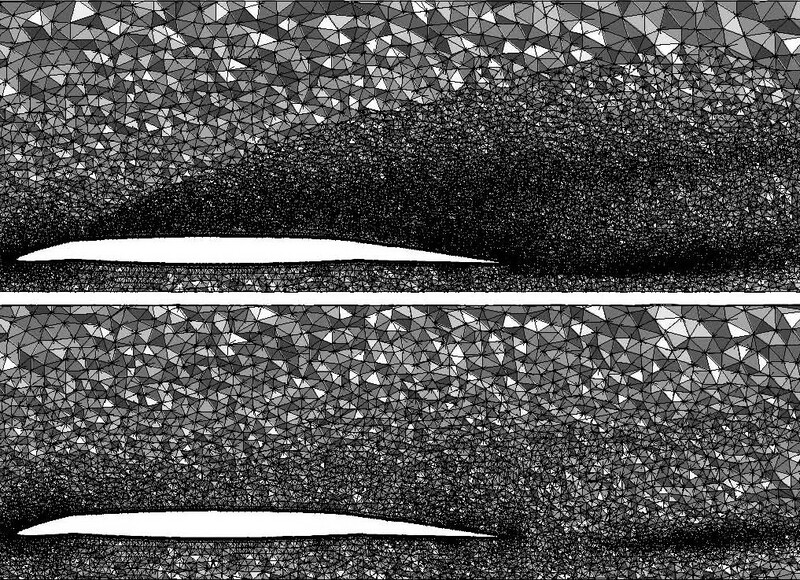 Grid adaption (using an in-house NASA Langley code, RefineMesh) was used to put more points into the separated flow region, as shown in Figure 2. The unsteady DES simulations captured low frequency shock oscillations due to the separated flow, as seen in the visualizations of Video 1 (bottom left). Time-averages of the flow were taken, showing a smeared out pressure profile that matched the experimental values more accurately than the RANS models, which had sharp, stationary shocks. The resulting time-averaged lift and pitching moment coefficients are shown in Figures 3 and 4, and are an improved match to the experimental values over the RANS models. The adapted grid provides the most accurate answer, due to the improved resolution of the time-dependent flow structures. A full aircraft grid was generated by mirroring the half-aircraft grid across the symmetry plane. The separated regions are shown in the Video 2 (bottom right), showing an unsteady shock oscillation that is asymmetric and low frequency. This combination leads to a very large rolling moment that occurs at a low enough frequency (around 1Hz), which can then drive the aircraft roll off. Therefore, this study identified the unsteady shock oscillations present in AWS as a trigger mechanism for wing drop. This contribution earned the research team the prestigious “Turning Goals into Reality” award from NASA. Figure 3: Coefficient of lift vs. angle of attack for the pre-production F/A-18E. 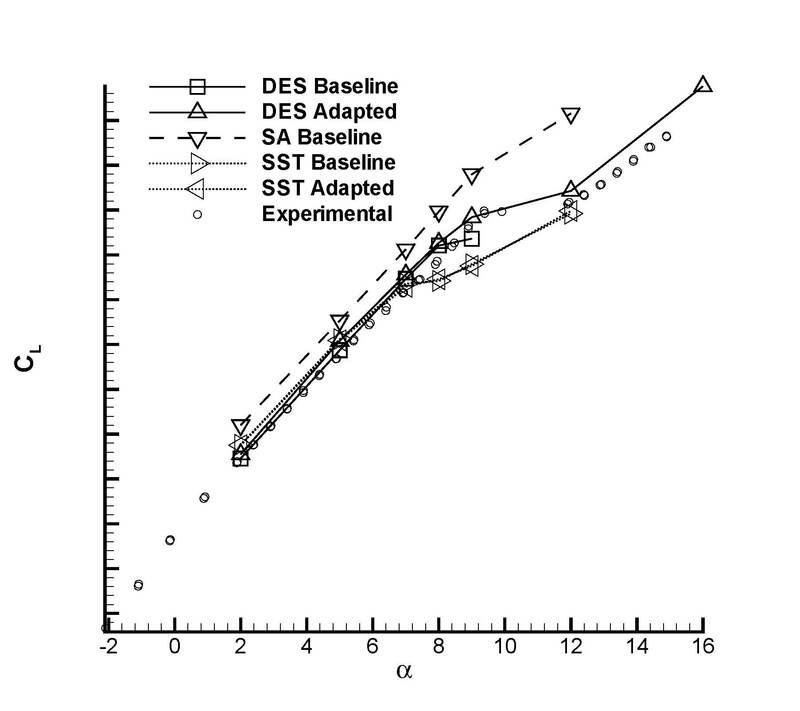 DES on a baseline and adapted grid vs. RANS models. Figure 4: Coefficient of pitching moment vs. angle of attack for the pre-production F/A-18E. 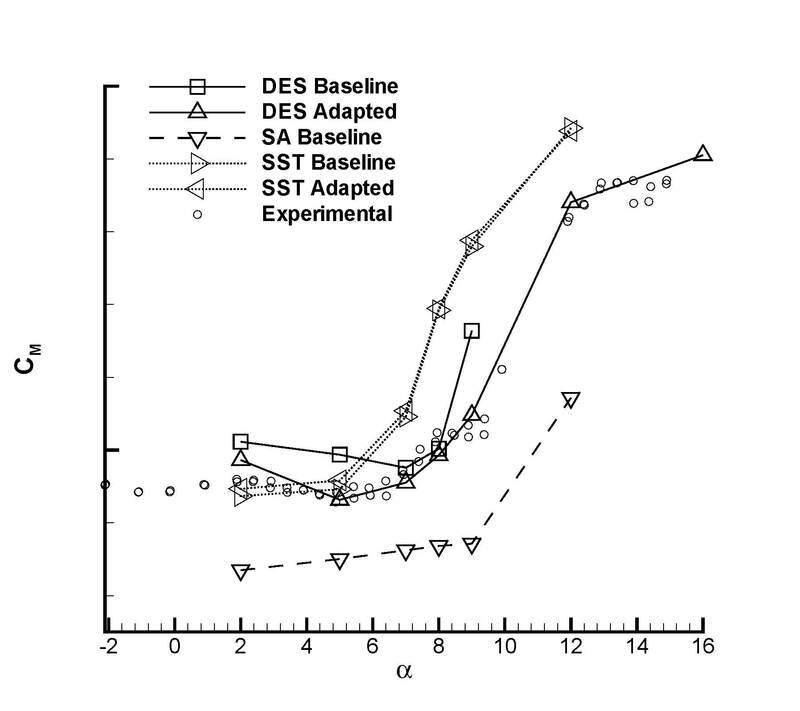 DES on a baseline and adapted grid vs. RANS models. Forsythe, J.R., Woodson, S.H., “Unsteady CFD Calculations of Abrupt Wing Stall Using Detached-Eddy Simulation,” AIAA 2003-0594, Jan 2003. Woodson, S.H., Green, B.E., Chung, J.J., Grove, D.V., Parikh, P.C., Forsythe, J.R., “Understanding Abrupt Wing Stall With CFD,” AIAA 2003-0592, Jan 2003. Hall, R.M., Woodson, S.H., Chambers, J.R., “Overview of the Abrupt Wing Stall Program,” Progress in Aerospace Sciences, Vol 40, Pp. 417-452, Oct 2004. Spalart, P.R., Jou, W.-H., Strelets, M., Allmaras, S.R., “Comments on the Feasibility of LES for Wings, and on a Hybrid RANS/LES Approach,” Proceedings of the First AFOSR International Conference on DNS/LES, Aug 1997.